If you’ve been reading this blog for a while you’ll know that I’m a huge fan of Susan Johnson’s work. I’ve read and enjoyed The Broken Book, reviewed Life in Seven Mistakes and On Beauty, featured Susan in Meet an Aussie Author, and recommended Life in Seven Mistakes as one of the ANZ LitLovers List of Best Australian Books. I think Susan Johnson is one of our best contemporary writers of literary fiction, who reinvents herself with every book she writes. So you can imagine what a thrill it was for me when I met Susan when she was down in Melbourne last year and we had a lovely long lunch together! Emma Young at The Age thought that My Hundred Lovers is ‘an original imagining of one woman’s waning flesh and the vibrant imprint of a life it still holds’. Felicity Plunkett at The Canberra Times found it ‘dazzling’, ‘provocative’ and ‘delicious‘, with slivers of a life juxtaposed in ways that generate wit and verve, and the sublime sits alongside the surprising. 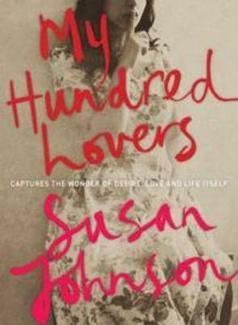 Chris Flynn at Meanjin found that My Hundred Lovers is a remarkable achievement, a genuine masterpiece of sensuality and an absorbing and very personal experience, like reading someone’s beautifully poetic and honest diary. Also see Fancy Goods; a sincere and very personal response at This Charming Mum; the Readalong hosted at All the Books I Can Read; and thoughts from my friend Marg at The Intrepid Reader. There’s an interview with Susan at Booktopia, and another at The Age. This is my first Susan Johnson book but I can guarantee you that it won’t be my last! There are moments when I have been shocked but most of the time I have found the main character to be someone that I can relate to and really impressed by how lovely I have found the writing! Thanks for including my link in your post. She’s such a brave writer, I love her books! BTW It’s my turn to shout you breakfast this school holidays, what about somewhere like the Rickett’s Point Tea House with a lovely view over the bay? Sounds good. Will have a look and see what dates might be a possibility. Lisa, I am a fan of Susan Johnson stories, and can’t wait to read this book. I’ve put it on reserve at my library. I admire your honesty about this and the integrity of not reviewing her book. I think probably so many book reviews in Australia are written by people who know each other personally, it’s great to see you raising the bar! Thank you Annabel – and no matter what the temptation might be, you and I are not going to lunch together until after I’ve read and reviewed your next book! I am looking forward to reading this book. I have always enjoyed Susan Johnson stories. It is on reserve for me at the library, but I have to wait as there are a couple of people in front of me on the reservation list. Sounds like a fine book. I admire you for wanting to keep your intergrity intact. Sometimes, one can’t help but be influenced by friendship and other relations when reviewing books written by ‘friends’. Walking that thin line can be dicey. Let me join in the chorus, Lisa. I wish more people had this kind of integrity, especially now that the blogging world means that we often get to interact with the author directly rather than through some kind of filter (such as a publicist or press officer). Am looking forward to the publication of this one, when/if it makes it to this side of the globe. Thanks, Kim, I do value my sense of fair play. I’m sure it will be published in the UK, Susan’s other novels have been.